9065 ft (2763 m) . 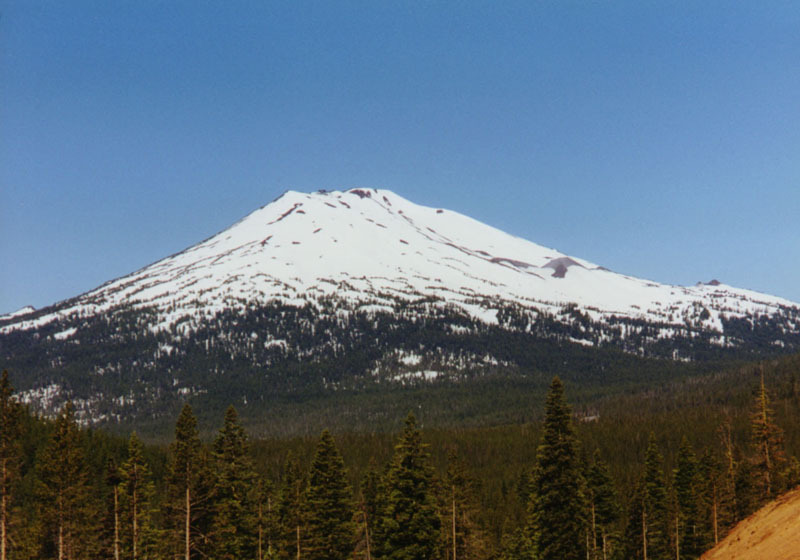 Located in the shadow of the Three Sisters, Mount Bachelor is nonetheless one of the most famous volcanoes in the Cascade Range, not because of its size or beauty but because it is home to the largest ski area in the US Pacific Northwest. If any volcano in the range had to be given over completely to lift-served skiing, Bachelor is perhaps the finest choice. Its very symmetrical form, consisting of a steep-sided shield surmounted by a composite cone, results in slopes of near perfect pitch for skiing, which drop from the summit over the full 360-degree circle. Tree cover on the upper portions is quite sparse, but the few trees are distributed along radial erosion furrows, thus creating ready-made ski runs and also protecting the snowpack from the winds. In addition, Bachelor is much less glaciated than its neighbors, allowing skiers to venture safely about the mountain without fear of crevasses. The one major glacial feature is a large cirque on the northeast side, which is still occupied by an inactive glacial remnant. 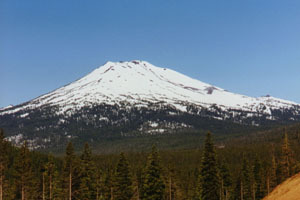 This cirque provides the steepest slopes on the mountain, with numerous gullies dropping from the summit between eroded lava pinnacles in the upper bowl, thus remedying Bachelor's only major terrain deficit. 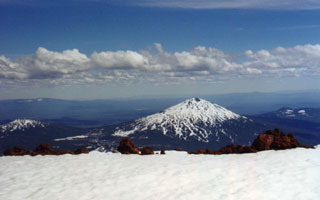 Despite its location a few miles east of the Cascade Crest, Bachelor still receives nearly 400 inches (10 m) of snowfall annually, and its snow retention is among the best of any ski area in North America, resulting in a ski season which stretches reliably from November to June, and often even into July. (11 km) After the lift-served season is over, those willing to earn their turns can still find nearly top-to-bottom skiing for a few weeks. 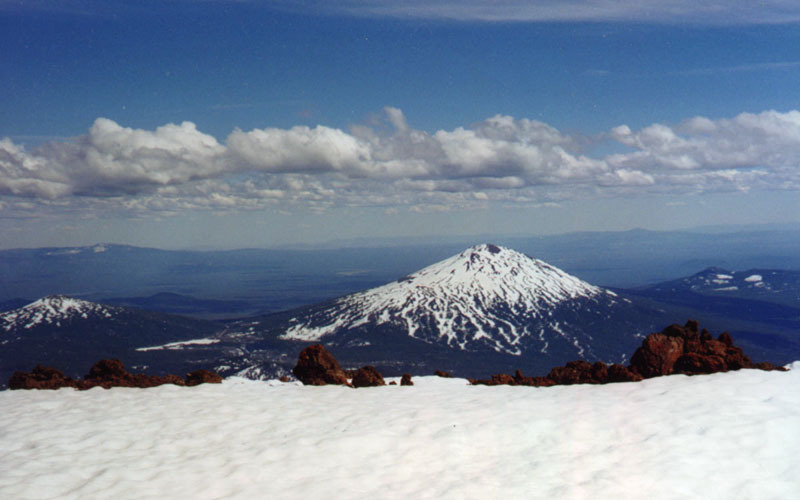 Large portions of "The Cirque" retain good-quality snow even into September, making this one of the easiest places (south of Mount Hood) to get in some quick late-summer skiing. The ascent route starts from the summer hiking trailhead, at the eastern (Sunrise) base area. 1988 You don't really need a map here, do you?